it is a great pleasure to participate in this important event on the “Global Standard for the 21st Century”. This is a unique opportunity to raise the paramount importance of integrity and ethics in the world economy. Thank you Minister Tremonti for asking me to launch the discussion. To build a stronger and cleaner global economy we need to think of the key elements of integrity and ethics. Progress in this area is the one essential ingredient to restore confidence in globalisation. The OECD is fully committed to step up its contribution to meeting this challenge. The OECD, together with the WTO, ILO, IMF and the WB, assists the leaders of the largest economies of the world, within the G8 and the G20, in shaping a new set of instruments which will represent the ‘founding principles’ of this cleaner global economy. They include a Global Standard on integrity, propriety and transparency in business and a Charter on global sustainable activity. The Italian Presidency of the G8 and the head of the German Government herself are at the forefront of this common effort and the OECD is closely cooperating with them. Minister Tremonti, you with your advisors and experts, are directly involved in the Global Standard and the OECD can contribute to this work, building on its existing instruments. I can see good reasons to bring these efforts forward and I am proud to support such a formidable challenge. Let me start by putting today’s developments in perspective. We are living the worst economic crisis of our lives. It is also the most global crisis ever. The size and complexity of the problem are linked to its remarkable global synchronisation. In all previous crises there was always a strong country or group of countries to bail us out. Today, all the major economic engines are affected. According to our latest Economic Outlook Interim Report, the OECD countries will contract by an average 4.3% during 2009; with the Euro area and the United States contracting by about 4% each. Japan’s GDP by nearly 7% and Canada’s by around 3%. As a result, unemployment rates in many OECD countries will reach double digits by the end of 2010. All these numbers have a human dimension, a social consequence: increasing global poverty. And this is unacceptable. There were many causes for this synchronised “power cut”, including massive regulatory, supervisory, corporate governance and risk management failures. There are also questions regarding honesty, propriety and transparency in the conduct of business. These issues may not be the direct cause of the crisis, but they are perceived to be closely linked to it, as multipliers of its effects and potential obstacles to its rapid solution. Efforts to improve the framework within which business, markets and governments should operate to achieve a stronger, cleaner and fairer world economy have been revamped by the G20 Summit in London. Leaders have not only supported discussion on a Global Charter for sustainable economic activity. They have also acknowledged the efforts in the G8 to prepare a set of common principles and standards on propriety, integrity and transparency of international and financial activity. That is, to prepare a Global Standard for the 21st Century. Politically, the two initiatives have been recognised as reciprocally reinforcing global milestones. Technically, they have converged in a transparent and constructive process. They can restore confidence and avoid a recurrence of the present crisis. They can avoid a backlash against open markets, and against globalisation. They deserve all our attention. If leaders want to go this way, the OECD is ready to help. Over the last 15 years, together with Member countries and many other players in the global economy, the OECD has developed a dense, far reaching and comprehensive set of policy rules. Whether legally binding, in the form of “soft law” or as recommendations, they provide best practices for policy makers in designing and carrying out sound policies and they also offer guidelines for the conduct of private sector business. This body of provisions exists in separate, individual “niches”, but we must now bring them together in a systematic and coherent way for easy use and effective guidance. We must also provide strong political support so that their adoption is generalised, and an effective monitoring system so that their implementation is assured. We all know the devastating economic and social damage of corruption. The OECD negotiated and now monitors the implementation of the Convention to Stop Bribery of Public Officials in Pursuit of Business Around the World. The UN Convention against Corruption is another milestone. They both need your strong support for effective implementation. The OECD Guidelines for Multinational Enterprises outline standards for business behaviour in the fields of employment, industrial relations, environment, competition, taxation and others. They are part of our investment policy principles. International standards for transparency and co-operation on taxation to counter tax abuse, particularly in tax havens and countries with strict bank secrecy, have been developed at the OECD and have been endorsed by the G20 and the United Nations. The Financial Action Task Force, housed in the OECD, engages a worldwide network on its recommendations against money laundering and terrorism financing. 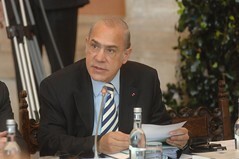 Other institutions are contributing to these efforts: the work of the IMF in developing a transparent framework for fiscal policy; the OECD and the World Bank’s joint work to disseminate the OECD Principles of Corporate Governance in all regions of the world; the ILO’s “Decent Work” agenda, and so on. These could be the building blocks of the “Global Standard”. The OECD instruments of course are of great help, but they have been there before the crisis. Therefore we must be open to upgrading them: how do we increase their effectiveness; their credibility; or even strengthen? The answer is to learn from our experiences of the past. This is what we are doing at the OECD: we test the relevance of our instruments and we make adjustments. Let me mention the example of corporate governance. Through the work of the OECD’s Steering Group, we have embarked in a review of our standards to enhance risk management and to provide the checks and balances needed for sound business practices. Moreover, the Steering Group has agreed to launch a new peer-review process to single out developments and practices that could undermine the future relevance of the standards. Our policy instruments are not written in stone. They are living tools. Any major failure should force us to rethink. This crisis has revealed the level of interdependence among our nations, but it has also revealed the deficiencies of our governance frameworks. It is time to change. We need more reliable, compact principles, agreed among the largest number of countries possible. It will be one of the strongest follow-ups of the London Summit: the signalling effects are potentially immense. We have to show that we are up to the expectations. We do not know which future summit geometry (G8 - 14 -15 - 20 - 22 - Gn?) or geometries, will be able to better cope with global challenges. A set of key standard principles and rules for this code of economic and business matters could certainly help to address this. This is why we are here today and I trust that this event will help create new approaches to such challenges.